Solid arguments can be made for both. Popular, proven Tier I ERP suppliers such as SAP, Oracle, Infor, and Microsoft Dynamics all have long, successful histories with positive reputations. Chances are good no one’s ever been fired for buying SAP or Oracle, which are considered less risky that “newer” solutions from less-well-known companies. The downside to them might be that they often need upgraded IT infrastructure to run the on-premise software and the dollars and time it takes to procure, install and bring online the required servers and communications networks. 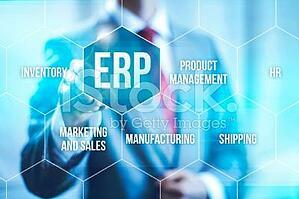 Still, on-premise ERP continues to be a safe bet for many medium to large enterprises. Cloud-based ERP solutions – like so many enterprise applications – are rapidly becoming the popular choice because they require little if any capital investment or infrastructure upgrade. Cloud ERP is becoming so attractive it’s no longer a question of if but when and which manufacturers will implement ERP in the cloud. According to Gartner, 47 percent of enterprises plan to move a majority of their core systems to the cloud in the next five years and SaaS-based manufacturing and distribution software will increase from 22 percent in 2013 to 45 percent in 2023. The cloud, though, does have its downside as well. Cloud-based solutions aren’t as mature and tested as on-premise ERP systems and don’t offer as much functionality as Tier 1 solutions that have been developed over decades. Also, some business processes might not be supported, requiring them to be performed outside the system and perhaps even done manually. So what’s a modern enterprise to do? The “best of both worlds” approach offers far lower implementation costs than a straightforward on-premise ERP solution and can utilize best-of-breed, cloud-based software to augment your rock-solid on-premise system. A hybrid ERP model provides a solid base of on-premise functionality and agile cloud applications to address both unique existing business processes and rapidly-evolving, high-impact areas of your business. This bi-modal strategy also presents the least amount of risk because the known core, on-premise ERP can be trusted to work reliably while the cloud can be used to add specific, limited functionality one project at a time to avoid major problems, delays, and unacceptable additional cost. Is the hardware your core ERP runs on still fully supported and addressing modern requirements? Is the underlying software still fully supported and addresses modern requirements? Are there resources available that can fully support the core ERP? Where does your existing ERP solution succeed and fail in supporting your existing processes? Which existing ERP functions are systems of record (core ERP) and which are systems of engagement (potential cloud application)? What parts of your manufacturing organization have custom requirements that are too difficult or too expensive for the core ERP system and might be better served in the cloud? To learn more about hybrid ERP and cost effective, strategic ERP options that increase functionality to meet all your business needs, without having to replace your current system, check out our short webinar, Hybrid ERP: Finding the Right Set of Solutions for Your Enterprise.